While I have nothing but admiration for those of you who grill outdoors in the snow all winter long, that’s just not me. First of all, it rarely snows in Seattle. Second, grilling in a drizzle just isn’t as dramatic or satisfying as braving the snow to cook outdoors. (I mean, I imagine that it’s not. I’ve never actually grilled in the snow. See above.) Anyway, it’s not summer now, which is grilling season in my book, which is how I ended up making a winter version of one of my favorite summer salads using roasted instead of grilled potatoes. I planned to serve this salad alongside a couple of pan-fried trout, but in the end the trout stayed safely on ice and we opened a can of smoked trout to flake into the salad to make it meal by itself. The contrasts here are quite nice: the peppery greens, creamy blue cheese, crisp hot potatoes, and the added salt and smoke from the trout if you go that route. Roasted Potato Salad with Arugula and Blue Cheese, with or without Smoked Trout: Slice potatoes 1/2″ thick (I used halved fingerlings), toss with olive oil and salt, and roast at 450 until crisp, turning occasionally. Meanwhile, make a vinaigrette by mixing 1 Tbsp. sherry vinegar with 3 Tbsp. olive oil, a dab of dijon mustard, and salt and pepper. Shake well. When potatoes are done, lightly dress a bowl of arugula and toss well. Add roasted potatoes and blue cheese and toss again. Divide into bowls and top with flaked smoked trout, if using. Dinner is served. This entry was posted in Fish, Salads and tagged cooking, fish, food, homemade, lifestyle, recipes, salad on February 24, 2012 by emmycooks. You salad sounds terrific. I haven’t seen smoked trout in a can here in New Hampshire but I can get smoked trout filets. No grilling in the snow for me. My husband and I don’t start grilling until we open our cottage in Maine sometime in May after all the snow has melted. Sounds like a lovely way to welcome spring! Maybe the smoked trout thing is an E. Coast/W. Coast difference–I often see cans and rarely see filets. I imagine that a flaked filet would be great. Maybe it is . . . I only ever see fillets too. No cans . . . but I imagine that they are both delicious! This sounds like perfection to me! 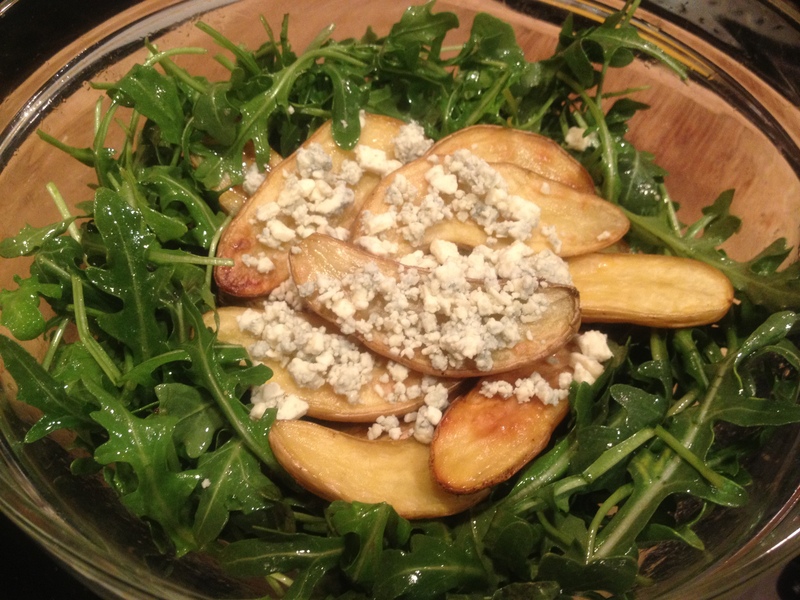 I love fresh arugula and the addition of the roasted fingerlings is just brilliant. I haven’t seen fingerlings recently, so I’ll have to find something similar. I’m a new follower and look forward to what you’ll be sharing next! Thanks for joining us, Allison! I have actually made this salad with various kinds of potatoes, and any flavorful potato that holds together well will be delicious. I love visiting the potato stall at my farmers’ market–there are so many great varieties available now! Enjoy. What a lovely, simple and satisfying salad. As for grilling in snow … I don’t. I just don’t think donning a parka and traipsing snow into the house is part of the barbecuing experience, although there are lots of people who are game for it. By the way, I like your cooking directions, such as a ‘dab’ of Dijon mustard. That’s how I cook, but I think I feel too obligated to provide actual measurements (or, guesstimeasurements) on my blog. Most of the time they’re just guidelines, since we should be cooking to taste and preference anyway! I’m glad to hear that you like the style of the recipes. I think that many people are intimidated by cooking because they think it requires knowing some specific formula that they don’t know–when really, you just have to know what tastes good to you! And I think that many experienced home cooks (like you and I, for starters) don’t measure everything in real life. So I hope that this approach helps to keep the recipes accessible. Looks like an amazing salad. I love the combination of blue cheese and arugula. I would never have thought of the smoked fish. Gotta try it! Your fingerlings look super yummy, btw!